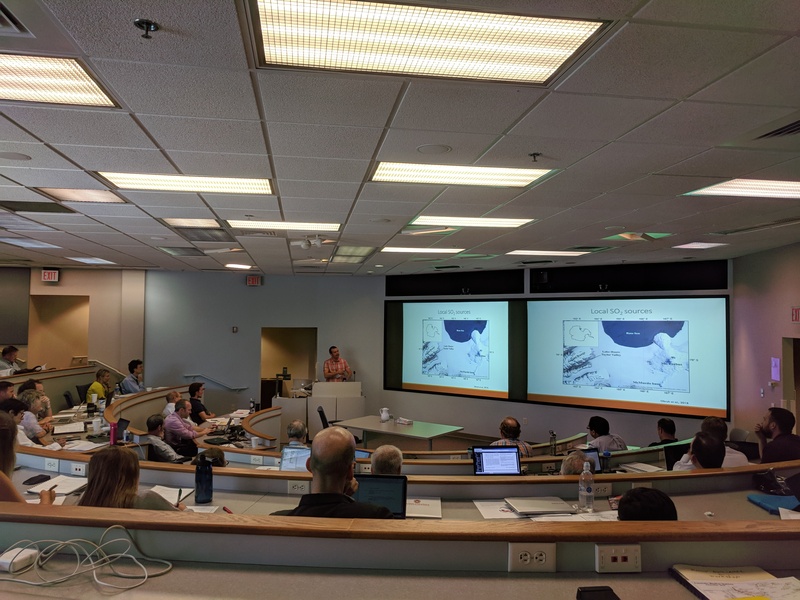 Researchers from around the world convened mid-July in Madison, WI to attend the 13th Annual Workshop on Antarctic Meteorology and Climate and Year of Polar Prediction-Southern Hemisphere, hosted by the UW-Madison Antarctic Meteorological Research Center (AMRC). The three-day conference brings together the Antarctic research community including forecasters, atmospheric scientists, pilots, archivists and others who work to better understand the southernmost continent. Antarctic research is largely an international collaboration, with more than a thousand scientists and support staff making the journey to the continent each year during Antarctica’s summer months. 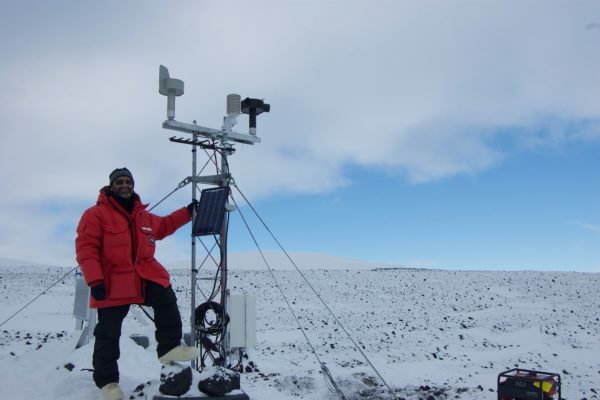 Among the scientists making the annual trek are members of Lazzara’s team who perform maintenance on more than 57 Automatic Weather Stations (AWS) clustered in the westernmost part of Antarctica. Owned by the UW, they’re engineered and designed to withstand the Antarctic climate of extremes. 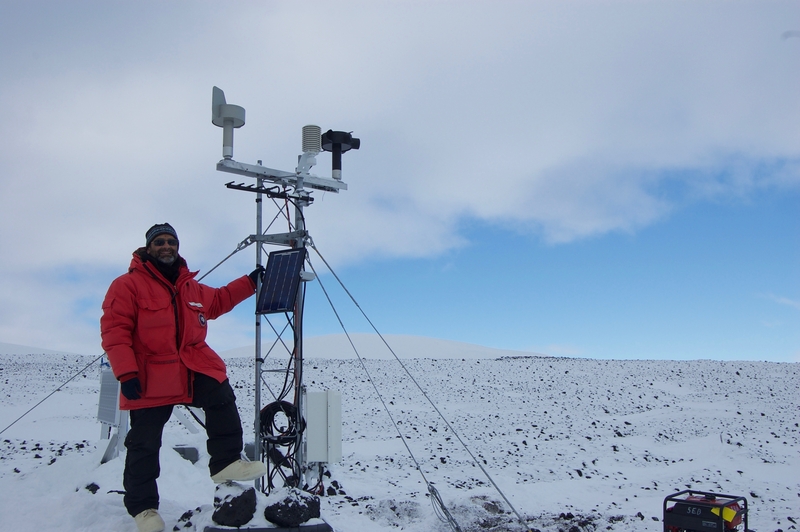 The AWS systems, with rare exceptions, continuously collect atmospheric measurements, including temperature, humidity, wind speed and wind direction. These weather data, along with station data collected by international partners, are being used to build a more robust climate record for the various regions of the continent. Twice the size of Australia, Antarctica is comprised of different regions which can experience drastically different weather conditions due to changes in elevation, atmospheric currents, and proximity to the oceans. A team of researchers recently identified the coldest place on Earth, nearly -146° Fahrenheit, by analyzing thermal measurements from NASA’s Landsat 8 and Aqua polar orbiting satellites from 2004-2016. The low temperatures occurred in a region near the East Antarctic ice divide, where readings can frequently dip below -140° Fahrenheit during the winter months (May-September). Lazzara, who was a co-author on the paper, says this temperature extreme is likely as cold as the planet can get. Lazzara notes the distinction between temperature measurements taken from satellite radiances compared to those gathered by instruments on the ground. The record setting -146° Fahrenheit was recorded from the Landsat 8 data based on the infrared skin temperatures – the surface temperature differentiated from the temperature of the atmosphere – which differ from many previous records taken in situ with thermometers resting between two to three meters above the surface. The area of the WMO Antarctic Region (all lands and ice south of 60°S) delineating the 2500 meter elevation and showing locations of Signy, Esperanza and D-80, the three high temperature extreme stations. Credit: School of Geographical Sciences and Urban Planning, Arizona State University. At the other extreme, Lazzara and his team also supported research to identify the highest temperatures for various regions of the continent. In a paper published in early 2017, the team sorted through years of climate data and verified a record high of 67.6° Fahrenheit located at Signy Island in 1982. 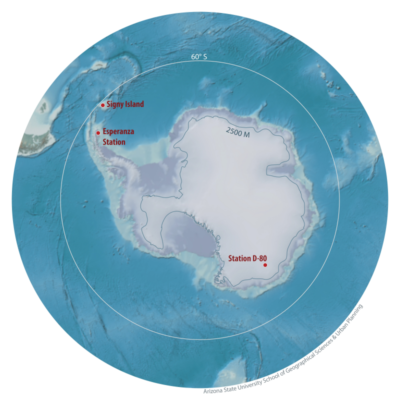 For record keeping, the Antarctic is divided into regions based on latitude, beginning with locations south of 60° latitude where the Signy Island measurement was recorded. Farther inland, near the Adélie Coast, AMRC’s automatic weather station D-80 registered a record high of 19.4° Fahrenheit in December 1989. Now, with observational data extending back from 1957, scientists are amassing enough information to begin to tease apart the clues to Antarctic and global climate. This work is supported by the National Science Foundation, Madison Area Technical College and the University of Wisconsin-Madison.